Cross-country skiing to Woods Lake, Winnemucca Lake, and Frog Lake in a loop is one of my favorite cross-country ski tours at Carson Pass. Although the route is only 6-7 miles, it features over 1,000 feet of elevation gain and it’s all in backcountry terrain above 8,000 feet. The higher elevation also makes Carson Pass a great place to cross-country ski at the beginning and ending of the winter season since it’ll receive and retain snow better than locations found at lower elevations. This three-lake route is most appropriate for intermediate to advanced cross-country skiers because it requires you to use pretty much every cross-country ski technique in your tool box – diagonal striding, double poling, side-stepping, herringbone, and enough downhill technique to enable you to safely negotiate some steep and narrow sections. You need to be athletically fit because at times it can be a slog, particularly if you find yourself skiing uphill in deep, untracked snow (which is common at Carson Pass). Map #1. Click on the above map to enlarge it for better viewing and printing. This map is only for reference and shows the general route for the three-lake loop at Carson Pass. Your trip may look slightly different than mine based on your specific route selection. You don’t necessarily have to stay within the lines when traveling over snow! Always carry a traditional topographic map and compass when traveling in the backcountry. If you’re not proficient with the above mentioned cross-country ski techniques, but still want to cross-country ski at Carson Pass, I recommend either skiing directly to Winnemucca Lake or to Woods Lake. The journey to Woods Lake constitutes the first leg of the longer three-lake loop featured in this article. I’ve included an additional map specifically for this modified trip, as well as a few details about the route so please continue to read. Both of these beginner options are an out-and-back route and, although they still feature hills and require the know-how to effectively negotiate them, they are more manageable for newer cross-country skiers. Always know your limits, and don’t be afraid to turn back when you reach them (or take off your skis and walk!). Map #2. Click on the above map to enlarge it for better viewing and printing. This map is only for reference and shows the general route for the shorter route from Carson Pass down to Woods Lake (and back). Always carry a traditional topographic map and compass when traveling in the backcountry. The two main options for parking are at 1) Carson Pass or 2) Woods Lake parking area. I prefer to park at the north lot of Carson Pass because the lot is highly visible, plowed regularly, and it’s well traveled. However, there is a parking fee ($5/day, $25 seasonal pass—the fine for not having a pass is $94.50) because it’s a Sno-Park. 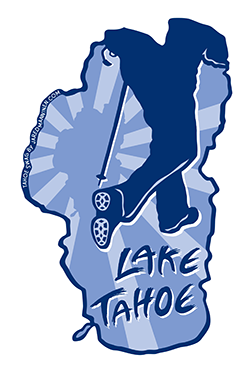 Come prepared by buying a pass in Meyers or South Lake Tahoe because you can’t purchase one at Carson Pass. From the north lot you do have to cross SR 88 to reach the trailhead, but you can clearly see in both directions of the highway and it is single lane so it’s a relatively short distance to cover. The north lot is also generally less crowded than the south lot. Ultimately, though, you’ll complete this cross-country ski tour at the south lot, so either area is fine for parking. Six of one, half dozen of another. Just know that you’ll need to make your way down the short wooded hillside behind the parking lot to get to the meadow area, which I consider to be the beginning of this loop. I do not recommend walking along the highway from the south lot to the meadow area because it’s too dangerous. If you don’t want to ski your way through the trees behind the south lot just walk the short distance down the hill (assuming the snow isn’t too deep). The other parking option is to begin at the Woods Lake parking area, which is west of Carson Pass along SR 88 a short distance (before you reach Caples Lake). People park here in the winter to access Woods Lake via snowshoe or cross-country skis. This is not a bad option to start your journey because you’ll get to ski the gentle downhill from Carson Pass to your vehicle at the end of your tour. However, my concern with parking at the Woods Lake lot is that it’s not visible from the highway or as popular a trailhead as Carson Pass. I might be paranoid, but I don’t like leaving my vehicle unattended for hours in an isolated lot in the woods. There are no guarantees in life, but at least if your vehicle is parked in a more trafficked area (like Carson Pass) the presence of passersby might discourage a potential thief from attempting to break into your vehicle. The other consideration, and probably a more important one, is that in the case of an emergency it would be better to travel back to a more populated area than to a less populated one (i.e. Carson Pass versus the Woods Lake parking lot). Here’s a map to assist you in finding the parking area for Carson Pass. You can cross-country ski this loop in either direction. However, I prefer to travel it counter clockwise so that the last section is basically a return from Winnemucca Lake along the well-traveled trail that leads to the south Carson Pass parking lot. Again, this is fueled by safety considerations because I often travel alone, so being forced to link up with other people (on the main thoroughfare) toward the latter half of my journey is me trying to be as safe as possible, all things considered. On the other hand, if you’re going to be cross-country skiing this route with a partner and like to rip it downhill (even with the skinny skis! ), I’d recommend traveling in a clockwise direction. The open hill on the west facing aspect of the ridge nearest Winnemucca Lakes is amazing. You’ll just have to figure out how to link up with the route to Woods Lake once you reach the trees. This shouldn’t be too much of a problem, though, because at this point you’ll be in a relatively wide open gully and you’ll just need to keep going downhill. Also, there are blue diamonds tacked to trees in this section marking the trail. Keep your eye out for them. Many people travel along this route in one fashion or another, but because the weather at Carson Pass and around Round Top and Winnemucca Lake is so unpredictable, expect to have to break your own trail for long sections. Study a map thoroughly before embarking on this tour (and bring it with you just in case). I wouldn’t consider any aspect of this route as being too technically demanding, but Carson Pass can be so windy that many sections of snow can be wind-scoured and crusty, making for icy conditions. There are also some short and steep sections that can’t be negotiated by skiing a lower angle, but rather require you to know how to effectively regulate your speed downhill. Traveling between Woods Lake and Winnemucca Lake (in either direction) is, in my opinion, the crux of this route. If you experience any type of emergency in this area, it’s going to require a lot of effort to get back to the highway. There’s simply not a direct route out of the backcountry from this zone. This is why, as a lone skier, I prefer to travel in a counter clockwise direction. I can just take my time making my way up from Woods Lake to Winnemucca Lake rather than getting overzealous about going downhill and risking wrecking myself in a crash. With the generalities of the route covered, here are a few specifics to consider. FYI, I’m writing the remainder of this article based on traveling in a counter clockwise direction. Begin at the small meadow across the highway from the north parking lot of Carson Pass. The trail down to Woods Lake is most obvious closer to the highway. Just make your way a few paces due west (near the highway) to find the actual trail. Feel free to ski a loop around the meadow (as indicated on Map #2) for a warmup, but make sure you circle back around toward the highway to reconnect with the trail. This first leg of your trip is approximately 1.25 miles and down a gentle slope through the trees. At the end of this section you’ll encounter a concrete bridge (see photo). Go across the bridge and continue along the trail to Woods Lake. At this point you’ll be on the official Woods Lake Trail and the signs are pretty obvious. The only confusion you may run into is when passing a small sign that says “trail” and features an arrow pointing into the woods. Ignore this sign for the time being and continue cross-country skiing on the main trail. Before you reach Woods Lake, you will find a wooden bridge that crosses the outflow of Woods Lake (see photo). There is also a big signboard near it for posting notices. Keep skiing on the main trail to access Woods Lake, but then return to this bridge and cross it. Then, travel uphill through the trees until you reach the large Winnemucca Trailhead sign and the smaller sign pointing you toward “Trail Head Parking.” If you’re going back to Carson Pass via the modified beginner route (i.e. not completing the entire three-lake loop), travel in the direction of Trail Head Parking. You will then meander through the forest and ski across another bridge (that again spans the outflow of Woods Lake) to return to the main trail where you first saw the small sign with the arrow that said “Trail.” From there, simply retrace your tracks back up to Carson Pass. This modified route is approximately four miles long. 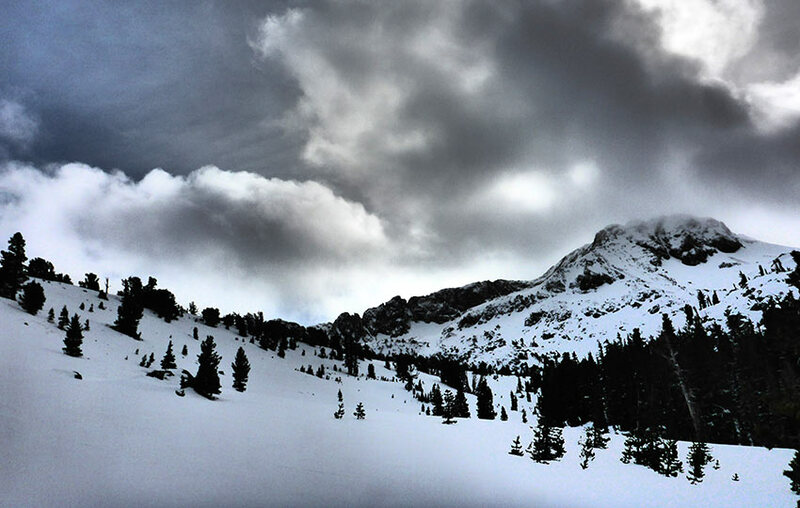 To complete the full three-lake tour, cross-country ski past the large Winnemucca Trailhead sign up the gulley. It’s about 1.5 miles to Winnemucca Lake from here, and it’s all uphill. Follow those blue diamonds tacked to the trees and/or keep your eye on Round Top, which sits directly above Winnemucca Lake (and is visible for most of this section). After reaching Winnemucca Lake, travel to Elephants Back (the big hump northeast of Winnemucca Lake). Contour the base of Elephants Back along the western side until you reach the most northern aspect of the mountain. Here you’ll find great views looking east. Then, traveling a little further north and contouring the ridgeline from Elephants Back, you’ll practically ski right over Frog Lake. From Frog Lake you’ll need to reconnect with the main trail that leads to the south lot of Carson Pass. You should be able to follow someone else’s tracks at this point, but if not, head west to find the trail. The main trail should be obvious because it’s so well used. However, if you find yourself skiing lower and lower without seeing any signs of other skiers (or their tracks), you probably need to backtrack. I’ve made this mistake before—traveling west too soon and heading down the gully in the direction of Woods Lake. Needless to say it was a rookie error and wound up adding an extra hour to my time. But I just couldn’t resist following all that great snow downhill! This last bit along the main trail to Carson Pass can be a little challenging toward the end of the day because it features some narrow and slightly steep sections. Be careful through here because lots of accidents occur toward the end of a trip due to fatigue and exhaustion. If you parked at the south lot of Carson Pass, great! Head to your vehicle. If you parked at the north lot, remember that you still have to make your way down the small hill through the trees (behind that south lot). Again, take care while negotiating this brief section. And definitely look both ways before crossing SR 88 on your way back to your vehicle!